During this time of the Synod on the Family in Rome, we pray that the Sacrament of Marriage will be held up in all holiness, unity and indissolubility. We pray for you, parents, that you may spend and be spent for the purpose of sanctifying one another and the offspring that God brings into the world through your mutual love and obedience to His command: be fruitful and multiply. The sacrifice required of you is total, not 50:50 or 75:25. Each must give 100% or the union will be one of great unhappiness and failure. The Church has not erred and does not err in teaching that the bond of marriage cannot be loosed even on account of the sin of adultery and, thus, it is evident that all other weaker excuses cannot be just cause for annulment. Imperfect separation of the parties is allowed, but the bond is never severed! The most essential ingredient of a successful marriage is Humility! Peace in marriage is a Gift of the Holy Ghost, which must be protected even in the midst of anxieties, contradictions and opposition. A gentle look can repress a quick temper; a difference of opinion can be arrested by a single word. If we are to conquer and keep an inner peace, we must be prepared to accept with calm and courage whatever happens. Pain, opposition, misunderstandings, even calumnies, all are possible and, being human, we cannot but feel them keenly; still, we can always turn for comfort to Jesus. Kneeling before His Tabernacle, we can pour out our troubles, all that has upset us and made us lose our balance. He alone knows all, understands our weakness and, if we humbly ask, He forgives us. Childlike, we lay our faults and troubles at His Feet, and obtain His pardon and promise. We leave comforted and strengthened to try again tomorrow. How we must be filled with gratitude to God for His divine assistance at every turn! All our suffering and pain can be a source of peace. Many sick people arise in the morning, make again their FIAT, take up their cross and greet the new day in peace. Once they have finally accepted their lot, perhaps after years of struggle, with God’s help, they have peace. Such individuals, often without knowing it, pass on their peace to others. Goodness and kindness are love in action. Christ healed the sick, gave sight to the blind, made lame men walk, and brought the dead back to life. He comforted those who mourned, fed the hungry, changed water into wine, forgave sinners, died for His enemies and prayed for them with His last breath. Pray that peace may flourish in your soul and ask for the humility needed in order that your home may be a happy one, whose center will always be the Meek and Merciful Hearts of Jesus and Mary. My benediction is extended to you throughout the month as we remember, during November, the Holy Souls in Purgatory. These dear souls cannot help themselves, so the Masses you arrange for them is a gift both infinite and essential. May God reward your great charity! Dear Mrs. Melvin,My nephew and I just returned from Lesotho. Our eighty-five year old translator had a stroke last month and without her to cook for us in Lesotho, we arrived with no one knowing we were coming; the stove had to be connected to a propane tank, silverware found, dishes with insects crawling on them were rinsed (we had to buy dishwashing soap), the sink had no running water or drainpipe and the freezer had no fuel. We worked with flashlights as the solar lights were not connected. We gave someone money to buy propane for the freezer (there is no refrigerator) and he came with it the next morning, balancing the large tank on the back of a mule coming from town. The milk could then be cooled but on the last day was frozen, so we had to melt it in boiling water to have some for breakfast on the cereal. Our first meal was instant noodles cooked in boiling water. We could not make tea since we turned off the flame after boiling the water for the noodles and did not have matches at hand to relight it. Two ladies helped with the cooking beginning the next day, when they found out that we were there. I must admit that I wanted to abandon ship and return home when no one came to the Mass the next day and I lost a contact somehow in the hut where we stayed. I said to my nephew that this bad start is a sign that special graces are on the way, and so it happened. We never had so many people at the Mass and a good number of people wanted either to be received into the Church or receive the Sacraments. On Sunday, a tent was hired by the daughter of our sick translator, even though she is Anglican. She heard that we were overcrowded and decided to help solve the problem. There were between 100-120 faithful at the outdoor Mass, double of the last Mass two months ago. The tent was not big enough for the crowd. My nephew counted 45 small children sitting on a tarp in the front of the tent. There were seven Baptisms of small children after the Mass. I was expecting only two but twenty candidates showed up. The translator came to the Mass in a wheelchair and told me which small children were from families who are practicing Catholics. After the Baptisms, I spoke to the families who wanted their children baptized and decided that I could baptize the same number next month. But I do not know if we will have use of the tent and most likely the numbers will be even higher than this time. There were many new people who came, and one lady asked to be received into the church. There were many new voices singing at the Mass and they broke out in song when the actual Baptisms took place and the giving of the candles. (They all brought candles for the ceremony; instead of taking them home, they gave them for the church to use at Mass). The translator’s sister-in-law went to confession after having been going to her husband’s Anglican Church. Now, her husband wants to join the Catholic Church along with her daughter (who is married to a Catholic) and her teenage grandson and granddaughter. The grandmother said that she will teach them all. She cooks for us and leads the singing very enthusiastically. A Catholic lady who entered a “natural” marriage with her husband asked to be married in the Church and her husband wants to be baptized. Numerous children are now getting catechism from an older lady in the “parish,” who is preparing them for their first Communions. The faithful asked again for a chapel, but I told them that the superior is not in favor of it, but would rather that a mission be established in Maseru, the capital city. We gave out most of the remaining religious literature in Sesotho and the Sacramentals that you gave us in the previous months. 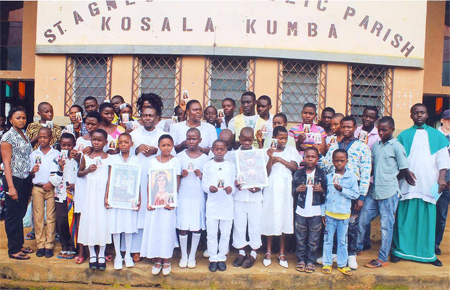 See the picture of the children holding up the holy cards that you sent. May I ask the cost of getting more religious article for our faithful in Lesotho? 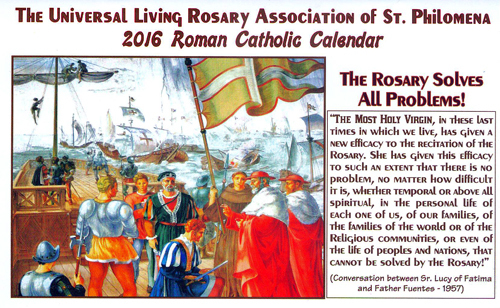 We have Scapulars and Rosaries, but not the Sesotho flyers for the Miraculous Medals, etc. that you sent. 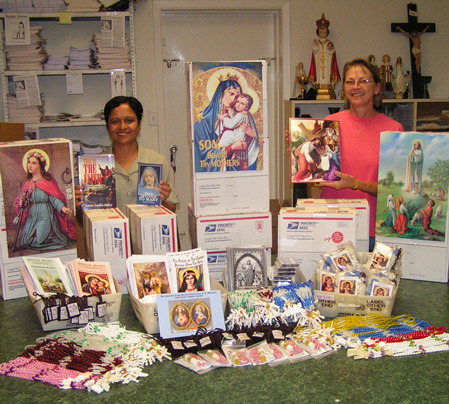 Your support has encouraged more souls to come to the Masses now and to be baptized. May God bless you for your zeal for souls in far corners of the world! PRAYER: Come, O Spirit of Understanding and enlighten our minds that we may know and believe all the mysteries of salvation; and may merit at last to see the eternal light in Thy Light; and in the light of glory to have a clear vision of Thee, and the Father and the Son. Amen. PRAYER: Come, O Spirit of Counsel, help and guide me in all ways that I may always do Thy Will. Incline my heart to that which is good; turn it away from all that is evil, and direct me by the straight path of Thy Commandments to that goal of Eternal Life for which I long. Amen. PRAYER: Come, O Spirit of Wisdom, and reveal to my soul the mysteries of heavenly things, their exceeding greatness, power and beauty. Teach me to love them above and beyond all the passing joys and satisfactions of earth. Help me to attain them and possess them forever. Amen. Give them life with Thee on high; Give them joys which never end. Amen. The Gifts of the Holy Ghost perfect the supernatural virtues by enabling us to practice them with greater docility to divine inspiration. As we grow in the knowledge and love of God under the direction of the Holy Ghost, our service becomes more sincere and generous, the practice of virtue more perfect. Such acts of virtue leave the heart filled with joy and consolation and are known as Fruits of the Holy Ghost. These Fruits, in turn, render the practice of virtue more attractive and become a powerful incentive for still greater efforts in the service of God. PRAYER: Come, O Divine Spirit, fill my heart with Thy heavenly Fruits: Thy Charity, Joy, Peace, Patience, Benignity, Goodness, Longanimity, Mildness, Faith, Modesty, Continency and Chastity that I may never weary in the service of God, but by continued faithful submission to Thy inspiration may merit to be united eternally with Thee in the love of the Father and the Son. Amen. O, Holy Ghost, I offer Thee the Eucharistic Heart of Jesus, His most Precious Blood, the sorrowful, humble, pure, obedient and Immaculate Heart of Mary, to repair for all my offenses and negligences. I consecrate myself unreservedly to Thee. I place all my trust in Thee. Help me to make Thee better known and loved throughout the world. Give me an intense zeal for souls to console Jesus, strengthen my love and confidence in our Blessed Mother. O Mother of God, sanctified by the Holy Ghost in thy Immaculate Conception, pray for me. O ye Apostles of the Lamb, filled with the Holy Ghost at Pentecost, and crowned with living fire, pray for me. A certain artist has depicted Mary as the Spouse of the Holy Spirit. The picture shows Mary standing upon a globe, which represents the world. Above is the Blessed Trinity. Directly over her head hovers the Holy Spirit in the form of a dove. Graces, represented by rays of light, stream from Him into Mary’s heart, and from thence pour themselves upon the earth in seven streams, symbolizing the seven Gifts of the Holy Spirit granted to men through Mary’s mediation. In several passages of Holy Scripture, the Holy Spirit Himself calls Mary His Spouse. Even at the first instant of her conception, He imparted to her so great a fullness of grace that all the Angels and Saints combined have not attained such a degree of perfection. Enraptured by Mary’s beauty, the Holy Spirit exclaims in admiration: “How beautiful art thou, My Love!” (Cant. 4:1) But it was above all at the Incarnation of the Son of God that Mary became the true Spouse of the Holy Spirit, for she conceived the Eternal Word in the power of the Holy Spirit. Through Mary, with Mary, and in Mary, the Holy Spirit brought forth the God-man and, in like manner, He brings forth, every day, to the End of Time, the elect children of God. St. Louis Grignon de Montfort says: “The Holy Spirit imparted to Mary His immeasurable gifts, and has made her the dispenser of all His graces, so that she distributes His gifts and graces to whom she will, as much as she wills, and how and where she wills. No grace is given by Heaven to man except through her virginal hands.” St. Bernard and St. Alphonsus and many other theologians hold the same opinion. To enable Mary to fill her new sublime office as Mother of all God’s children, she required another plenitude of grace, and this she received from the Holy Spirit at His coming on Pentecost. Mary had joined the Apostles in the Cenacle and, for nine days, had prayed with them and sighed for the coming of the Divine Comforter. It was due chiefly to her prayers and ardent desires that the Holy Ghost came down with such treasures of grace. Through Mary, we must seek grace, for she is the Spouse of the Holy Spirit, and all graces are dispensed through her hands. Let us often greet Mary as the Spouse of the Holy Spirit. In Memory of Your Departed Loved OnesWhen we love, we remember, and this memory – the effect of love – is not a barren thought. It resolves itself into DEEDS for the loved one. They are at peace for they have escaped Hell forever. But, they are sentenced for a time to expiating fire. Behold their plight and helplessness. Listen to their lamentations. In sympathy and charity, hasten to their assistance. The Living Rosary volunteers, Dhanaraj Rodrigues, Ruban, Berchmans, Valan, Victor, Sahayaraj, Arockia Prasad and Antony Raj were invited by the Parish Priests of St. Theresa of Infant Jesus Parish, St. Bernard Church, Sahaya Madha Church, St. Jude Church, St. Patrick Church, Our Lady of Lourdes Church, St. Dominic Savior Higher Secondary School and the Amali Bency Prayer group in the States of Tamilnadu and Andhra Pradesh. The Retreats were conducted from 30th August to 11th October, 2015 and 525 new members were enrolled in the Living Rosary. Thank you for your prayers and support. God bless you! Those who devoutly assist at the public novena in honor of the Holy Ghost immediately preceding the Feast of Pentecost, may gain: (1) An indulgence of 10 years on any day of the novena; (2) A plenary indulgence, if they take part in at least five of the exercises on condition of Confession, Communion and prayer for the intentions of the Sovereign Pontiff. Almighty and Eternal God, Who hast vouchsafed to regenerate us by water and Holy Ghost, and hast given us forgiveness of all sins, vouchsafe to send forth from Heaven upon us Thy sevenfold Spirit, the Spirit of Wisdom and Understanding, the Spirit of Counsel and Fortitude, the Spirit of Knowledge and Piety, and fill us with the Spirit of Holy Fear. Amen. On my knees, before the great multitude of heavenly witnesses, I offer myself, soul and body, to Thee, Eternal Spirit of God. I adore the brightness of Thy purity, the unerring keenness of Thy justice and the might of Thy Love. Thou art the strength and light of my soul. In Thee, I live and move and am. I desire never to grieve Thee by unfaithfulness to grace, and I pray with all my heart to be kept from the smallest sin against Thee. Mercifully guard my every thought and grant that I may always watch for Thy light, and listen to Thy voice, and follow Thy gracious inspirations. I cling to Thee and give myself to Thee and ask Thee, by Thy compassion, to watch over me in my weakness. Holding the pierced Feet of Jesus, and looking at His five Wounds, and trusting in His Precious Blood, and adoring His opened side and stricken Heart, I implore Thee, Adorable Spirit, Helper of my infirmity, so to keep me in Thy grace that I may never sin against Thee. Give me grace, O Holy Ghost, Spirit of the Father and the Son, to say to Thee always and everywhere: “Speak Lord, for Thy servant heareth.” Amen. O LORD JESUS CHRIST, Who, before ascending into Heaven, didst promise to send the Holy Ghost to finish Thy work in the souls of thy apostles and disciples, deign to grant the same Holy Spirit to me that He may perfect in my soul the work of Thy grace and Thy love. Grant me the Spirit of Wisdom that I may despise the perishable things of this world and aspire only after the things that are eternal; the Spirit of Understanding to enlighten my mind with the Light of Thy Divine Truth; the Spirit of Counsel that I may ever choose the surest way of pleasing God and gaining Heaven; the Spirit of Fortitude that I may bear my cross with Thee and that I may overcome with courage all the obstacles that oppose my salvation; the Spirit of Knowledge that I may know God and know myself and grow perfect in the science of the Saints; the Spirit of Piety that i may find the service of God sweet and amiable; the Spirit of Fear that I may be filled with a loving reverence towards God and may dread in any way to displease Him. Mark me, dear Lord, with the sign of thy true disciples and animate me in all things with Thy Spirit! Amen. Come, O Blessed Spirit of Holy Fear, penetrate my inmost heart that I may set Thee, my Lord and God, before my face forever; help me to shun all things that can offend Thee, and make me worthy to appear before the pure Eyes of Thy Divine Majesty in Heaven, where Thou livest and reignest in the unity of the ever Blessed Trinity, God, world without end. Amen. The Gift of Piety begets in our hearts a filial affection for God as our most loving Father. It inspires us to love and respect, for His sake, persons and things consecrated to Him, as well as those who are vested with His authority, His Blessed Mother and the Saints, the Church and its visible Head, our parents and superiors, our country and its rulers. He, who is filled with the Gift of Piety, finds the practice of his religion, not a burdensome duty, but a delightful service. Where there is love, there is no labor. Come, O Blessed Spirit, possess my heart. Enkindle therein such a love for God that I may find satisfaction only in His service and for His sake lovingly submit to all legitimate authority. Amen.